Overcoming challenges throughout the entire trail! 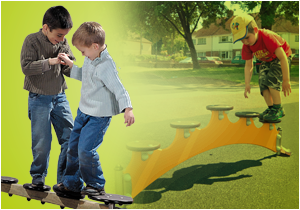 Trails enable sequences of movements that will help children develop their motor capacities. Crossing a beam, moving forward on unstable steps, climbing, crawling, hanging ... children learn to manage their body in space, acquire better movement coordination and develop their concentration. Trails also offer varying levels of difficulty, encouraging children to take risks and push themselves beyond their limits.